Violence in schools is not new. Several recent reports - one by the American Psychological Association and another by the National Education Association - show a dramatic increase in the incidence of school violence. While the information in these reports is undoubtedly accurate, they help to create the mistaken impression that school violence has only recently emerged, as if to imply that there was once a more peaceful past. However, if one examines history, it is clear that problems related to violence in schools have been around for almost as long as schools. To a large extent, that is because traditionally, urban public schools have served poor children, and poor children have experienced violence for a very long time. But we must recognize that in many ways, our schools are safer than the communities where many children live. At least in schools, there are rules against violence and adults present who are supposed to enforce them. On the streets, in the playgrounds, and even at home, there is often no such protection. While it is true that schools are confiscating more weapons, and that acts of violence are being committed with greater frequency, in comparison to what is going on in society generally, our schools are still relatively safe. However, too often, the individuals responsible for enforcing school discipline and maintaining order may have no credibility in the eyes of students. I can think of several schools where you can find kids shooting dice in the hallways or engaging in some other blatantly inappropriate behavior, and the teachers and other adults will pretend not to see it because they are afraid to tell the kids to stop. In urban schools, most teachers do not live in the communities where they work, and have limited knowledge of what their students' lives are like outside of school. This gap is often compounded by differences based on race and class. These factors add to the inability of teachers and school personnel to respond effectively to the causes of violence in schools. In addition, the usual punishments mean little to many kids. The threat of suspension or expulsion may be meaningless to a child who has already experienced failure in school or who may not attend regularly. Yet this continues to be relied upon as the only way to deal with violent behavior. Currently the most fashionable response is to make schools more like prisons. In recent years, New York City has spent close to $28 million installing metal detectors. It is ironic that we are using prisons as our models for safety and security, even though prisons are generally not safe places. When I look at this problem, I see it not only through the eyes of a researcher or policy-maker, but through personal experience. As a former teacher of African Studies at a continuation high school, I have worked with many young men who have been incarcerated and who have lived with violence. As a school board member, I have presided over expulsion hearings for students who have committed acts of violence. I also work closely with parents and teachers trying to develop an effective response to the violence that consumes our youth. I also remember what it was like for me, growing up in New York. The schools I attended were violent places. At an early age, I learned that bullies often got their way, that the best way to avoid a fight was to show no fear, that you must always be prepared to hurt someone if necessary. At 14, my cousin of the same age was stabbed to death for refusing to give up his leather jacket. Most people I knew accepted violence as an ugly but unavoidable part of life. At a gut level, I understand why kids fight or why they might react violently toward a teacher. I know why so many of them see violence as a legitimate means for resolving problems, because I have felt the same way. However, in our society, we often categorize individuals who commit acts of violence as deviants. Many counselors and psychologists view violent behavior as a form of conduct disorder based on maladaptive tendencies. This type of labelling presumes that there are some who are potentially dangerous and who should be kept away from the rest of the population, which is ostensibly made up of good, honest, law-abiding people. But the dividing lines are artificial and leave us totally dumbfounded when a young person with no past record of violent behavior suddenly "goes off" on someone. The failure of traditional methods of addressing school violence makes it more likely that alternative methods will receive serious consideration. As a starting point, we must identify some of the factors that contribute to the problem. Factors such as the availability of guns and the promotion of violence in the media and by political leaders may seem beyond the control of parents and school personnel. While I believe we must also devise strategies for addressing these issues, practically, we may want to start by focusing on how to create an environment within schools that promotes respect, dignity, and non-violence. In my own research in schools, I have found that children consistently admire and respect those teachers that are strict in setting high standards for behavior and academic performance, and who demonstrate a personal interest in their students. Most schools have at least one such teacher, but too often, that teacher functions in isolation rather than being utilized as a role model. Establishing mentoring relationships among teachers and encouraging collaboration through dialogue over these issues is one way of spreading knowledge and experience around. There are also ways to address security that do not dehumanize the school environment. At one junior high school in Oakland, California, an elderly woman serves as the campus security monitor, rather than an armed guard or a large, intimidating man. She lives in the same community as the children and understands their reality, their culture, and their needs. Without the threat of force, she is able to break up fights, enforce basic school rules, and keep those who do not belong off the campus. She can do this because she can speak in terms that the children understand, and most of all, because they know she truly cares about them. She has a moral authority derived not from her position, but from who she is and what she represents in their community. In my interviews and conversations with students who attend schools with a reputation for violence, I am struck by their total dissatisfaction with their schools. Rather than appreciating the opportunities that might be created as a result of their education, they see school as useless and futile, and have no respect for their schools or the adults who work there. In fact, their feelings about school may be so negative that the institution itself may become the object of their violence through vandalism or harassment directed at teachers and other adults. Increasingly, middle-class suburban schools, and even schools in affluent areas, are experiencing problems with violence. However, the problems of urban schools are particularly acute and complicated by their connection to poverty, crime and despair in the urban environment. Urban schools must not only address the academic needs of their students, they must also find the resources to provide social and psychological support to students and their families. Many schools are unable to respond to these issues because they define their mission too narrowly. Too often, problems like violence, drugs, teen pregnancy, and others are seen as beyond the scope of what is feasible for a school to address. Clearly, extra resources in both funding and skilled personnel are needed to expand the services schools provide. But perhaps even more important is the need for a broadened vision of what schools can and should do to respond to the needs of children. Violence in schools is only a symptom of a much larger problem facing society. There are no easy answers. But at the minimum, we have to find ways to bring more adults with whom kids can identify into direct contact with kids on a regular basis. This may not sound like much, especially when compared to the high-tech solutions promoted in most quarters. But in the long run, it may have the greatest impact. 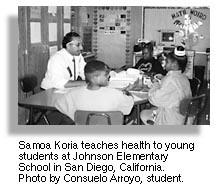 More articles by Dr. Noguera.